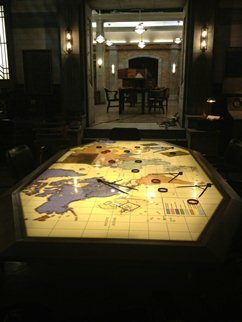 * The main space consists of the "War Room", which centers around a table with an illuminated map of the world. There is also a bank of computers and communication devices. * There is a large library with shelves of books, a card file index, and many files. A variety of weapons are also on display. At the rear of the library is a very large telescope. * There are large wooden tables in the library. At the end of [[12.18 The Memory Remains]], Sam and Dean sit in the library wondering what their legacy will be a hundred years from now. Sam suggests the people they saved will be their legacy, because they left the world better than they found it. Dean wonders about the bunker, if other hunters will move in. Dean gets out his knife and he and Sam carve their initials into the library table as they had done in the Impala (as see [[5.22 Swan Song]]). The final shot of the episode shows Mary Winchester's initials alongside the initials Sam and Dean engraved. * Room 28, level 2 - A laboratory where Dorothy mixes up the spell to bind her soul to that of the [[the Wicked Witch of the West]] to keep her captive. It also houses a large computer which was installed in 1951. * The library bookcases and columns are on wheels to make it camera-friendly. * The staircase was originally used in [[Crowley]]'s torture chamber in season seven. * The staircase was originally used in [[Crowley]]'s torture chamber in Season 7. 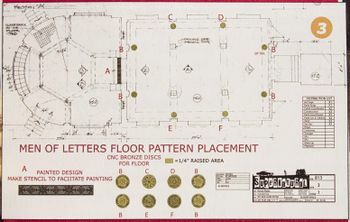 * The [[devil's trap]] used in the dungeon was previously used in [[Bobby's Panic Room]] in Seasons 4-6. Returning to the Bunker, Sam and Dean find Crowley still locked in the dungeon and he offers a [[Deals and Pacts|deal]] in exchange for helping them with the demons on Earth. Finding Kevin getting ready to leave, Dean convinces him to stay by telling him that he is family now and the Winchesters would do anything to protect him. Sam and Dean later sit in the main room discussing the current situation. Sam goes on a run and to get food without Dean ever knowing he's gone, surprising him when he returns. While discussing Sam straining himself after being so badly affected by the [[trials]], [[Gadreel|Ezekiel]] takes control to tell Dean that Sam is feeling better and that he is slowly but successfully healing him. Ezekiel reveals that a faction of [[Angel Lore|angels]] are after [[Castiel]] and after Ezekiel gives up control, Dean tells Sam this and they start searching for him. After Castiel is rescued from a rogue [[reaper]], he returns to the Bunker with the Winchesters, but Ezekiel warns that he must leave as he is too dangerous to have around with angels searching for him as even with the Bunker's protections, they won't survive a full angel incursion. As Ezekiel will leave Sam and flee if Castiel stays and this means a death sentence for Sam, Dean is forced to tell Castiel to leave the Bunker. In 1935, after the Bunker is finished, [[James Haggerty]] and [[Peter Jenkins]] settle in as the first two [[Men of Letters]] assigned there. Six months later, they have grown bored with nothing to do -- until [[Dorothy Baum]] arrives with [[the Wicked Witch of the West]], trying to find a way to kill her using the Bunker's files. The three are unable to find anything and soon the Wicked Witch escapes and possesses Jenkins, forcing Haggerty to kill him. Dorothy then casts a spell to bind herself and the Wicked Witch to stop her and her plans. Haggerty spends the rest of his career trying to find Dorothy and stop the Wicked Witch, recording his efforts in the Bunker's files. In 2013, Sam discovers that the map table is connected to an antique computer, so he and Dean call in [[Charlie Bradbury]] to hack it and use it to try to find the location of all the angels in the world. Dean accidentally knocks over the bottle containing Dorothy and the Wicked Witch, freeing them. As Charlie downloads all of the information in the computer, the three soon discover Dorothy who explains what happened. Sam, Dean, Charlie and Dorothy team up to hunt down the Wicked Witch who is still in the Bunker trying to get the [[key to Oz]] which the Men of Letters had somehow gotten into their possession and was now in Dean's room after finding it while doing inventory. Using poppy seed extract bullets, the four are able to fight, but not defeat the near-invincible Witch. Eventually Charlie figures out that the ''Oz'' books were written by [[L. Frank Baum]] to leave clues for his daughter Dorothy, and the two find Dorothy's motorcycle still in the Bunker's garage even after over 75 years. In the motorcycle, they find the ruby slippers which Dorothy figures can be used to kill the Wicked Witch. While Dorothy distracts a possessed Sam and Dean, Charlie kills the Wicked Witch with the slippers and stops her from bringing her army of Flying Monkeys to Earth through the door to [[Oz]], which she opened with one of the Bunker's doors. 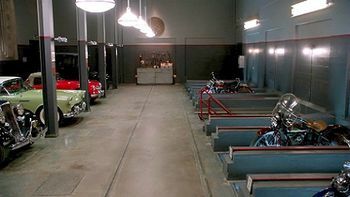 With the crisis over, Dean moves the [[Impala]] into the Bunker's newly-discovered garage and Dorothy and Charlie travel to Oz to free it from the forces of evil. Unable to translate the angel tablet into English, Kevin is able to use the Bunker's books to translate it into an obscure form of Cuneiform. As he, Sam and Dean set out to use the Bunker's 24 volume Cuneiform books to try to translate it, Dean gets a call from Castiel in Rexford, Idaho and leaves to investigate, using it as an excuse to get out of translating. Later, Kevin and Sam make a deal with Crowley to translate the bits referring to [[Metatron]]'s spell in exchange for allowing him to [[Goblet of Blood|call]] [[Abaddon]]. After the call, Crowley translates the text to learn that Metatron's spell is irreversible and Sam calls Dean to let him know. Alone in the dungeon, Crowley is later seen injecting himself with Kevin's blood. In the Bunker, Kevin Tran finds a section of the angel tablet that's so obscure that it's as if Metatron wanted to keep it hidden from a [[prophet]]. Dean asks Kevin for a spell that would hobble an angel, so that one could speak to the vessel's owner without the residing angel listening in. Kevin uses the angel tablet and an old Men of Letters book to find an [[angel suppressing sigil]] which Kevin and Dean paint in the storeroom. Kevin knows Dean is withholding information, but trusts him anyway. After giving Kevin a [[Hunter's Funeral Pyre|hunter's funeral]], Dean smashes up part of the Bunker's main room in his anger. Castiel arrives and Dean explains what happened. After Castiel comes up with the idea to use Crowley to free Sam from Gadreel's control, the two visit him in the dungeon and eventually release him to help them. In Sam's subconcious, he is working in the Bunker on a case involving [[ghouls]] and dead cheerleaders. Crowley, upon possessing Sam, meets him here in the main room and helps him realize the truth. Crowley and Sam battle Gadreel in the dream bunker and after pinning Gadreel to the floor, Sam expels him from his body. After attempting to enjoy a sandwich in the Bunker's main room, Castiel continues the process of healing Sam which is nearly complete only to discover that he still has some of Gadreel's [[grace]] inside him. After learning from a file written by James Haggerty that if the grace is extracted it could be used in a spell to track Gadreel, Sam and Castiel go to a room with a chair set up for the procedure and Castiel proceeds to start extracting the grace. However, after it nearly kills Sam who doesn't care, Castiel stops the extraction and finishes healing Sam, eliminating the rest of the grace. The two try the spell, but find that they didn't have enough grace to do it. Castiel then leaves to find Metatron, believing him to be the key to setting everything right. Sam and Dean discover the Bunker is haunted by the [[ghost]] of Kevin Tran. Kevin explains that as he died there and people who die can't get into [[Heaven]] now that its closed off, he is trapped on Earth. Kevin asks for Sam and Dean to find [[Linda Tran|his mother]] who he has learned is alive from another ghost named [[Candy]]. Sam and Dean agree and leave. At the Bunker, Sam is researching the [[Mark of Cain]], while Dean is frustrated as he repeatedly calls Crowley to no avail. In the Bunker, Dean stands in the shower, slowly dragging his hands through his hair and over his eyes as the water pours over him. He then stands in front of the mirror and wipes away the steam. He looks into his own eyes for a second and sighs. His eyes then wander to his right arm and he rubs the Mark of Cain with his left hand. In the war room, Sam reports to Dean that while he found some signs of demonic activity, there is no trace of Abaddon. As Dean rubs at the Mark, Sam asks if he is okay. Dean asserts that he is, and they get back to work. Sam is sleeping in his room when Dean wakes him up with loud music on his cell phone. Sam jumps up, gun in hand, and questions Dean. Dean claims to not be tired and says they have work to do. As Dean packs up weapons in the library, Sam joins him. Dean tells Sam that he talked to Castiel who says something is happening in Missouri. The Winchesters decide to go help, and when Dean picks up [[the First Blade]], a concerned Sam insists that they leave it behind. After some argument, Dean agrees. Sam finds what he think may be a clue -- a man called Drew Neely who had killed his family and disappeared three years earlier has been found dead. Sam theorizes that Neely was possessed by a [[demon]], who may have possessed Dean and left Neely's body to die. Sam calls to share the news with Castiel, who is anxious for news of Dean. Picking up that Cas is seriously unwell, Sam backtracks and tells him not to worry, that the clue probably isn't anything. Having captured the now-[[Deanmon|demon]] Dean, Sam traps him in the Bunker's dungeon and attempts to treat him with the [[demon cure]], although this is complicated due to the Mark of Cain further corrupting Dean's emotions. While the cure begins to take effect, it eventually reaches a point where Dean becomes just human enough where [[devil's trap]]s have no effect on him, while still emotionally corrupting him to try and kill Sam. After pursuing Sam through the Bunker, Dean is captured by Castiel, allowing Sam to complete the cure and return Dean to normal. It is revealed that they keep a master set of keys in a drawer in the War Room. As Sam and Dean are researching the Mark of Cain in the Bunker's main room using the [[Men of Letters]]' files, Sam gets a call from [[Sheriff Jody Mills]] who tells them about a body that has been eaten whole. Despite her insistence that they don't help her, they decide to go help her anyway. After a call from Castiel, the boys join him in Pontiac to help him find [[Claire]]. Cas meets Sam and Dean at the Bunker and fills them in on [[Cain]], now that they know Cain is killing his descendants, they believe he will go after another Tolliver, Tommy's 12-year-old son, Austin, who lives in Ohio. Dean believes that he needs to kill Cain, and despite Sam's concerns for Dean, they decide to go to Ohio. [[Olivette]] reveals that there are bunkers scattered across the world and when the [[Men of Letters]] plundered the [[Grand Coven]]'s horde of powerful [[spells]] and potions, they were divided among the bunkers. Due to the weakened state of the Coven and the powerful warding on the bunkers, the Coven couldn't get at them. When Sam returns after having busted [[Metatron]] out of heaven along with Castiel, both he and Dean decline to mention any of the events that occurred during their time apart. Sam then goes into his room and reads a letter that [[Bobby Singer|Bobby]] had written to him concerning his mission to cure Dean of the Mark of Cain. At the Bunker, Castiel joins Sam, Dean and [[Charlie]] -- who is thrilled to finally meet the angel, and asks him to heal her carpal tunnel, which he obliges, healing her bullet wound as well. The four sit down to a meal of pizza and beer, Dean seems relaxed and good spirits, laughing and enjoying his time with his brother and friends, but Sam continues to worry about him. At the Bunker, Sam begins working through the Men of Letters archives. While researching, he finds an audio reel from May 16, 1956 detailing the expulsion of [[Cuthbert Sinclair]] from the Men of Letters for creating the [[Werther Box]] to protect the codex from the Grand Coven. It mentions that the Box was hidden at the Men of Letters Chapter House in St. Louis. As Dean and Sam return to the Bunker later, Dean tells Sam he's glad that at least the ''Book of the Damned'' is beyond the reach of the Stynes – still believing Sam burned it. The Winchesters do not notice Eldon Stynes following them. Rowena and Charlie continue to argue and not cooperate on their common task, which prompts Castiel to call Sam and urge him to come over and take control of the situation. However, Dean answers the phone. Castiel lies, badly, about why he is ringing. Dean confronts Sam about what Castiel is up to, but Sam denies knowing anything. Dean doesn't challenge him further, and decides to go out to buy pizza. Having failed to retrieve the ''[[Book of the Damned]]'' from [[Charlie Bradbury]], [[Eldon Styne]] suggests to [[Monroe Styne|his father]] that they raid the Bunker, taking what they can and destroying the rest. Monroe agrees, getting Eldon a new arm to replace the one he ripped off and sending him, his cousin [[Roscoe Styne|Roscoe]] and younger brother [[Cyrus Styne|Cyrus]] to do it. 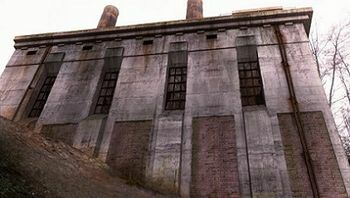 Arriving at the Bunker, Eldon blows the door off its hinges and finds it empty. He and Roscoe begin to steal what's valuable and prepare to burn the rest as Cyrus excitedly examines the books. Cyrus tries to convince his brother not to burn everything and fails, but they are interrupted by Roscoe stumbling in and dying after being stabbed in the back by Dean. In the main room, Dean and Eldon face off and Eldon taunts Dean about Charlie Bradbury's murder before Dean reveals that he wiped out [[Styne (family)|Eldon's family]] in revenge. He then shoots Eldon dead and murders Cyrus as he believes that despite the fact that Cyrus isn't evil now, he has evil in his blood and will eventually turn. A horrified Castiel confronts Dean and tries to convince him to let them cure him, but Dean refuses and tries to leave. When Castiel tries to stop him, Dean beats him up and nearly kills him. Dean leaves Castiel alive ultimately and leaves, warning Castiel to leave him alone or he will kill him next time. Castiel tells Dean he has found no new leads from [[angel radio]] or any new info on [[Metatron]] while he has been holed up in the Bunker, bingeing on daytime TV talk shows. Dean chastises him for switching from quality TV like ''The Wire'' or ''Game of Thrones'' and encourages Cas to turn off the TV altogether and get outside for a bit. Meanwhile, Sam is fielding a call from [[Detective Madsen]], letting the boys know that [[Len]] is dead. Walking past Sam's room, Dean finds him praying to [[God]] for answers about the visions he has been receiving. Dean tells Sam that God didn't show up to help them stop the [[Apocalypse]] so Dean doubts He will help them with [[the Darkness]]. Sam then leads Dean to the Bunker's library where Sam has been going over all the pre-Biblical texts Castiel was able to get from Gaza and tells Dean that half he can't read and the other half have nothing in them about the Darkness. Dean then gets a call from [[Sheriff Donna Hanscum]] about a case and they leave for Minnesota. After waking up, Sam finds the Bunker's kitchen filled with junk food and is greeted by his imaginary friend from when he was a kid, [[Sully]]. After Sam punches Sully and has a hard time believing he's real, Dean enters the kitchen as well and can't see Sully who tells Sam that he's invisible unless he wants to be seen. Sully makes himself visible to Dean, thus proving his existence to Sam. Sully explains that he's a [[zanna]], a being who helps kids by being their imaginary friend and he needs their help as [[Sparkle|his friend]] was killed. Dean and Sam go to the library to discuss the situation and Sam looks up zanna in the [[Men of Letters]] records which confirm what Sully told them. While Dean is reluctant to help, Sam convinces him to investigate the death of Sully's friend. After another vision of himself with [[Lucifer]] in [[Lucifer's Cage|the Cage]], Sam discusses with Dean the idea of going to the Cage and speaking to Lucifer over drinks in the library. Dean is reluctant to listen to Sam's idea since Lucifer had caused them so much trouble in the past, but Sam is insistent on the idea. After getting Rowena to agree to help, Sam takes her to the Bunker's dungeon to work on decoding the ''Book of the Damned'' in order to find a way to safely open Lucifer's Cage and talk to him. Sam calls Dean who is investigating an attack on a church by Amara and lets him know that the ''Book of the Damned'' definitely has what they are looking for though they're still trying to find it. The two discuss Dean's case and after Sam hangs up, Rowena comments on his lack of trust in her despite the Winchesters telling her that they were partners in their war against Amara. Sam reminds Rowena that she has the ''Book of the Damned'' and the means to read every word of it so he's not taking the chance of letting her go free with that. Moments after they finish their conversation, Rowena finds the spell they need and tells Sam to call Crowley and that she will need some ingredients for it. Sam calls Dean but is unable to reach him due to Dean seeing Amara face-to-face. While Sam initially wants to wait for Dean, Rowena convinces him to go ahead with the plan without him and they depart the Bunker for [[Hell]]. Once getting Rowena to agree to help, Sam takes her to the Bunker's dungeon to work on decoding the ''Book of the Damned'' in order to find a way to safely open Lucifer's Cage and talk to him. Sam calls Dean who is investigating an attack on a church by Amara and lets him know that the ''Book of the Damned'' definitely has what they are looking for though they're still trying to find it. The two discuss Dean's case and after Sam hangs up, Rowena comments on his lack of trust in her despite the Winchesters telling her that they were partners in their war against Amara. Sam reminds Rowena that she has the ''Book of the Damned'' and the means to read every word of it so he's not taking the chance of letting her go free with that. Moments after they finish their conversation, Rowena finds the spell they need and tells Sam to call Crowley and that she will need some ingredients for it. Sam calls Dean but is unable to reach him due to Dean seeing Amara face-to-face. While Sam initially wants to wait for Dean, Rowena convinces him to go ahead with the plan without him and they depart the Bunker for [[Hell]]. After leaving [[Castiel]] to check on the [[Smiting|mass-smiting]] of [[Amara]], Dean returns to the Bunker in search of Sam but finds the place empty. As he searches, Dean gets a call from Crowley who tells Dean that Sam is in Hell with Lucifer, enraging Dean. Dean later returns to the Bunker to get gold blades to kill the [[banshee]] that is attacking the people at the Oak Park retirement home. There Dean finds Lucifer looking for a spell to draw Amara out and, believing him to be Castiel, admits that he had two shots at Amara and failed to kill her. As Dean gathers three gold blades, he tells Lucifer the story of his encounters with Amara and admits to having an attraction to her. Lucifer is intrigued and tells Dean the attraction between him and Amara could be a good thing and could help draw Amara out. Dean then gets a call from Sam and checks the Men of Letters records for Edward Durban II and finds him as part of a Men of Letters delegation that was sent to Europe. After going over their plan for killing the Banshee, Dean leaves, making Lucifer promise not to tell anyone what they had talked about. After killing the banshee the Winchesters return to the Bunker where they find Lucifer gone. The two wonder about the strange behavior of "Cas" but dismiss it. Sam tells Dean about Lucifer showing him how Sam had abandoned Dean after he got trapped in [[Purgatory]] and admits he's never forgiven himself for it. Dean tells Sam he has and all that matters is they are together. The two then go to bed and Sam, unburdened, is finally able to sleep while Dean remains restless. Dean enters the Bunker's library with food to find that Sam hasn't found a new case or anything on Amara. Dean admits that he also doesn't have anything on Castiel. As the two discuss Dean's taste in food, they get a call from [[Claire Novak]] and go to Sioux Falls, South Dakota to see her. Dean enters the kitchen to find Sam pouring over history books and them out of coffee with spoiled milk. Sam tells him that he's going through the history books to find something that can help them defeat [[Amara]] and found information that the Nazis got their hands on a [[Hand of God]] but it was stolen by [[Delphine Seydoux]] who the Nazis believed was a Woman of Letters. The two then look through the Bunker's records and find a report in French written by Clifford Henshaw, a Bunker-based Man of Letters in 1943 that they translate using the Internet. They learn that after Delphine stole the Hand of God, Henshaw arranged for Delphine to transport the weapon back to the Bunker on the ''[[USS Bluefin]]'', but the submarine was sank en route and the contents never recovered. As a result, the Hand of God never made it to the Bunker. In order to get at the Hand of God, the Winchesters then call what they believe to be Castiel to the Bunker but is in fact Lucifer. Lucifer is surprised that any of the Hands of God survived the Flood and the twentieth century and tells them that he can get them to the past. After an argument about who will go, Lucifer takes Dean back in time to the ''Bluefin'', leaving Sam behind in the Bunker. After Dean and Lucifer return from 1943, Sam warns Dean that its not really Castiel who saved him. Lucifer throws Dean across the room and mocks his disguise as Castiel. Lucifer attempts to use the Hand of God to kill the Winchesters, but finds that its power was expended by Delphine using it on the German destroyer. As Lucifer advances on Dean, Sam draws an [[angel banishing sigil]] on the Bunker wall and uses it to banish Lucifer out of the Bunker, saving them. Sam enters the Bunker library where Dean gives him some Advil and lets him know that he's found an article on the death of Larry "The Hangman" Lee, [[John Winchester|their father's]] favorite wrestler. Dean suggests that they go to the funeral and tells a protesting Sam that they have no clues on how to beat Amara, find another Hand of God or save Castiel so he suggests they take a break. After stopping the rogue [[crossroads demon]] [[Duke]], the Winchesters return to the Bunker more determined than ever to stop Amara and Lucifer and rescue Castiel. As Dean futiley searches for a way to save Castiel from Lucifer, Sam searches the Internet and finds a [[werewolf]] case. While Dean is reluctant to go as he wants to find a way to save Castiel, Sam convinces him to leave the Bunker and go investigate the case with him. After getting the [[Horn of Joshua]], a Hand of God, Crowley calls Dean to tell him as he's making his morning coffee in the Bunker. Dean is dubious at first, worried that Crowley really hasn't escaped Lucifer and is being forced to help draw Dean into a trap. However, after Crowley reveals that he has a Hand of God, he gets Dean's attention. Crowley tells Dean where to meet him before hanging up and Dean calls out to Sam to get his attention. In an attempt to get Castiel to expel Lucifer, Crowley enters [[Jimmy Novak|his vessel]] and finds Castiel in the Bunker's kitchen with the door bricked up in his mind. Castiel explains that the kitchen, where he's watching a small TV is his safe place, but Lucifer's hold on Castiel proves too strong for Crowley to get him to expel the archangel. Lucifer then enters the kitchen in the form of his long-dead [[vessel]] [[Nick]] and attacks Crowley. As Castiel watches TV, Lucifer throws Crowley around Castiel's version of the Bunker's kitchen and nearly kills him before Sam [[exorcism|exorcises]] Crowley from Castiel and saves his life. After the failed attempt to evict Lucifer from Castiel, the Winchesters return to the Bunker where they discuss the events that had occurred. Sam and Dean note how similar Crowley and Rowena are in that they ran away when things got tough and discuss how even Lucifer with the power of a Hand of God couldn't harm Amara. Dean suggests that as Lucifer is a [[fallen angel]] he couldn't properly wield its power and the two vow to rescue their friend from Lucifer and Amara. A week after Castiel and Lucifer were captured by Amara, Dean sits in the Bunker's library, sifting through lore and trying to find a way to save his friend. Sam assures Dean that they will get Castiel back and that Amara needs him alive for something before showing Dean an article on his laptop of a girl disappearing outside of Gunnison, Colorado and then turning into [[Bisaan|a green-eyed mutant]]. Dean reluctantly agrees to work the case with Sam and they leave for Gunnison. After [[Chuck Shurley]] reveals himself as God, he teleports himself, Sam and Dean to the Bunker when Dean expresses doubt that Chuck is who he says he is. [[Kevin Tran]]'s [[ghost]] then appears from behind Chuck to the Winchesters shock and tells them to trust Chuck and whatever he has planned for them. Chuck then waves his hand and sends Kevin's soul to [[Heaven]] where it belongs. As Amara prepares to kill them, the [[Impala]] with Sam, Lucifer and Donatello is suddenly teleported into the Bunker's storage room. The group is shocked to find themselves back in the Bunker and Chuck emerges and tells them that he does occasionally answer a prayer and saved them. From across the Bunker's library, God and Lucifer see each other for the first time in millennia and comment on how much the other has changed. Chuck then heals Lucifer's injuries with a wave of his finger to everyone's shock. At the Men of Letters Bunker, Lucifer is acting like a sullen child, angry with his Father, wanting an apology for being given the Mark of Cain and then cast out. Sam and Dean try to intercede and get them to reach some kind of reconciliation so they can move forwards against Amara. They orchestrate a Dr. Phil-type intervention to get them to speak. After some bickering, God tells Lucifer that he was His favorite and that He gave him the Mark because He thought he was strong enough to handle it. When He realized He was wrong, He hated Himself and so He punished Lucifer. Then he sincerely apologizes. Chuck and Lucifer agree to work together to capture Amara and put her back in her cage -- she can't be killed because that would cause a disruption in the cosmic balance between Darkness and Light. Without the other archangels, though, they still don't have the power that was needed originally to box Amara. Unfortunately, they don't have the time for Chuck to rebuild the archangels as it's a much larger task than restoring rank and file angels like Castiel. Chuck asks for alternatives. Dean suggests Crowley, Lucifer suggest the angels, and Sam suggests Rowena who has the ''Book of the Damned''. Amara arrives at the Bunker, burning the [[warding sigils]] away so that she can enter. Amara is going through things in Dean's room, when Rowena gets inside her head and tells her that she is with God and she will show her where He is. Amara comes, telling Rowena that she knows it is a trap but she just wants a one-on-one with her brother. Following the disastrous conflict with Amara, Chuck teleports himself, the Winchesters, Crowley and Rowena back to the Bunker, stating that despite his weakened state, he can still do some things. With the universe ending, Dean chooses to get drunk while they wait for the end and briefly leaves to go on a supply run with the restored Castiel. While talking to God, Sam decides that they need to kill Amara to create a new balance. After God tells them that Amara's one weakness is light, the Winchesters depart to get the [[ghost]]s from Waverly Hills Sanitorium for a [[soul bomb]]. After they return, the [[reaper]] [[Billie]] arrives at the Bunker and upon learning of the situation, raids [[the Veil]] gets them the remaining souls that they need. With the influx of refugees from [[Apocalypse World]], the Bunker has become a way station for those who go out on hunts, with Sam delegating tasks to various hunters.